The CarpFever team challenged me to come up with an easy bankside dessert recipe based on a boilie flavour of my choice. Options are limitless, as there are many combinations and base flavours to choose from. A few ideas came to mind rather quickly. White chocolate, caramel, banana or coconut, but none of these will make for interesting eating... except if you have the luxury of an oven next to the water. So, a simplistic recipe inspired by the boilie flavour ‘peaches and cream’, was my preferred choice. The toughest part of this classic recipe is opening the can of peaches and smashing the tennis biscuits into crumbs. 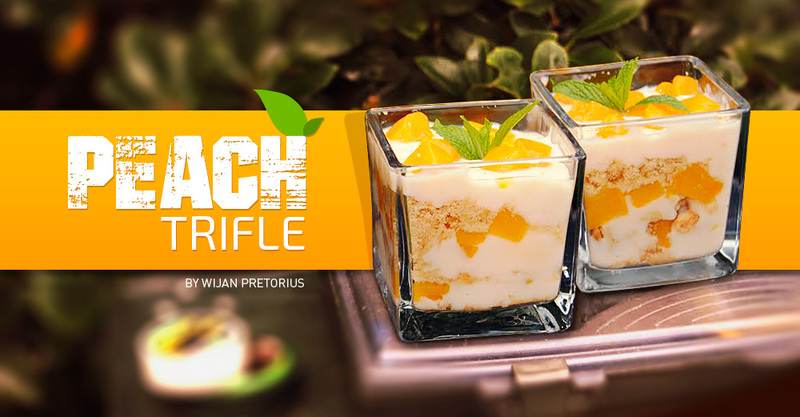 But, by simply layering the four ingredients, you'll have a pretty looking, cool dessert to enjoy behind your rods and also bring a bit of class to the bank. Open the can of peaches and drain the syrup into a separate glass. Throw the tennis biscuits into a plastic bag and crush them into crumbs. Assemble your dessert in layers. Start with the biscuits, alternating with a spoonful of yogurt, topped with sliced peaches and a spoon of honey. Layer the ingredients until you have reached the top of the glass. Garnish with a twig of mint and this will certainly look like something you ordered from room service. Enjoy this beauty any time of the day, and try to use yogurt that is well chilled. PS: Now go have that glass of peach syrup you dispensed from the can….YUM!